How should you run your 400m? Thus, is a differential of 1.5 to 2 seconds between the first 200 and second 200 the norm? Take a look at the IAAF Biomechanical Analysis from Berlin 2009. Renny Quow from Trinidad is the only sprinter in the group with near even splits. Otherwise, a differential between 1 and 3 seconds is the norm. Only 29% of the sprinters had a differential of between 1.5 and 2 seconds. Of course, some of the stats are skewed from the heats if they are leading and simply trying to conserve energy for the next round by “jogging” the last 100m. What are the open 200m times of the above athletes? I feel it is important to know what type of sprinter you are dealing with. The faster 100 sprinters require different Race Plans than those with much slower maximum speed but great Lactate Tolerance abilities. Proper planning requires finding the optimal 200 split for each type of sprinter and then really training the sprinter to BOTH increase Max Vel and learn to efficiently run the first 200 at the desired split time. Ideally, two equal segments could be achieved. For example, Lee Evans’s 1968 400 meter world record of 43.86 seconds had nearly identical splits of 21.9. I know Butch Reynolds could also replicate that type of efficency. Though, I don’t know what type of splits Michael Johnson’s 1999 world record at 400 meters had (43.18). John Smith also ran equal (22.2/22.3) when he set the 440 yard WR at 44.5. Notice that Evans, Reynolds and Smith were similar in terms of 200 speed but lacked the 200 speed that MJ had. Coaches need to know the type of 400 runners they have in order to develop training plans that replicate race plans designed for the type of sprinter (400/800,(Juantorena) 200/400,(MJ) 400/200(Smith, Reynolds, Evans) or 100/200/400. I notice that the first half was faster for all of the above races. Does anyone think it’s possible to run a negative differential in the 400m event? Is it physically possible to go out in 24.00 and return say in 22.00? Renny Quow came the closest to running and even race splitting 22.43 and 22.59.
if you run 20.91 and 10.6 what u think ur 400m should be? it depends if you have trained for the 100/200 or 200/400. If the latter, then 20.91 x 2 + 3.5 = 45.32. You need to get down to 20.75 regularly if you want to break 45. Jared Deacon shares the same sentiments. I would thnk the 10.6 would be a bigger issue than the 20.91. Also with the right running model, running 100 percent for 100m is not impossible and still keep running without dieing in the last 100m. my 400 in the 10th grade was 50.32 i was mad because i thought i should have ran 49. but now my 11th grade season is coming soon how can i run 47 or 48 seconds what are some tips or strategies for me to do that? I applaud your performance, and your intense desire to improve. I think you should begin by talking with your coach, and establishing your goals for the new season. If your desire is to run 48 by seasons end then you have to write a programme that will prepare to do that. Please, please, do not rush yourself or become impatient with your coach. Rushing your preparation in order to run fast times can result in you having a sporadic season or result in you being injured. 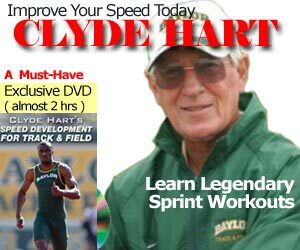 Become a student of the 400m; learn the event by watching videos of Mike Johnson, Merritt, Wariner, Felix, Richards, Gonzales, Butch Reynolds, etc…Knowledge is power.